While cleaning out my refrigerator last weekend, I spotted an English cucumber that I forgot to use. It was only a few days old so it hadn’t lost any of its crispness. I love cucumber slices in sandwiches or soaked in fresh lemon juice and sprinkled with salt. My sisters and I would eat bowlfuls of the latter when we were children, loving the refreshing, crisp-tart experience from the concoction. Last weekend, however, I was inspired to make something else. I decided to make little vessels out of my cucumber instead. But what would I fill them with? I browsed the pantry and refrigerator for ideas, but it was my nose that led me to a bright idea. The onions and shallots that I was caramelizing for my potato-broccoli soup smelled so sweet and flavorful that I couldn’t help but set a bit aside. I combined the caramelized onions and shallots with sour cream, chives, garlic and a bit of lemon juice for a quick filling. Topped with a bacon piece or two, I was happy to end up with a simple but elegant appetizer. Update 7/17/2012: For a seafood version on the filling, try this Seafood and Crab Dip instead of the caramelized onions. Note: Due to the popularity of this post, I thought I should make the instructions a bit clearer. The amount of caramelized onions/shallots listed above was taken from a larger batch I prepared for the soup referenced in the post. I caramelized 2 medium onions and 5 shallots. This amount would make more than 8 cucumber cups so feel free to adjust accordingly. This is a very flexible recipe. 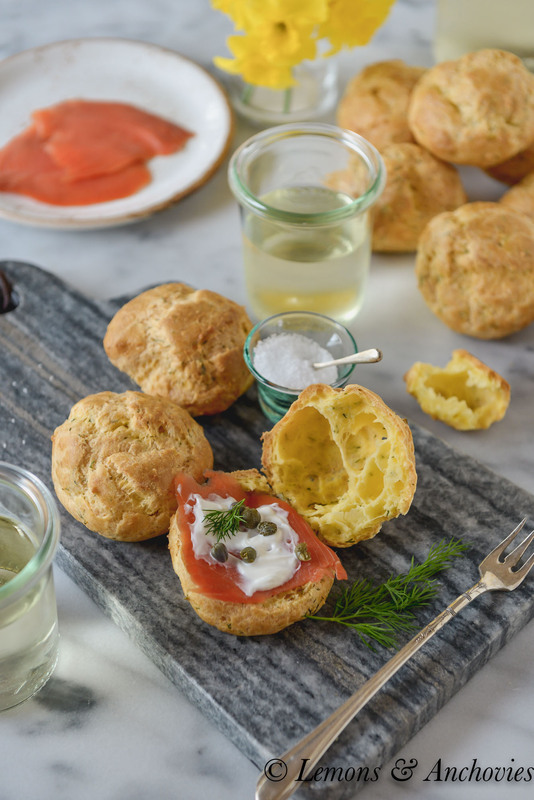 Simple ingredients make for one elegant appetizer. To prepare the caramelized onions/shallots: In a large pan, heat a few of tablespoons of olive oil over medium heat. Add the onion and shallot slices and sauté for about 30 minutes over moderate heat or until caramelized and brown. In the meantime, prepare the cucumber cups: Cut the cucumber crosswise about 1 - 1.5 inches in length. Scoop out the center of each of the cucumber pieces to make a cup. I used a melon baller for this. Make sure your cucumber pieces are big enough to leave a base for the cups after you scoop most of the meat out, again, at least one inch. To prepare the filling: Combine 4 tablespoons of caramelized onions and shallots with the sour cream and chives in a bowl. Start with just a little until you have the right onion to sour cream ratio you prefer. Season to taste with garlic, salt and lemon juice. Spoon the filling into the cucumber cups, top with bacon pieces. These are best chilled a bit for serving. I large cucumber will make 8 cups but I have included the cooking instructions for more than 4 tablespoons of the caramelized onion/shallots needed. This will make much more than you will need using one cucumber so feel free to adjust the rest of the filling ingredients accordingly. It is a very flexible recipe so add more sour cream, garlic, salt and lemon according to taste. Alternatively, it would be great as a dip served with other veggies. These look wonderful. I bet the crisp cucumber is perfect with the creamy center! 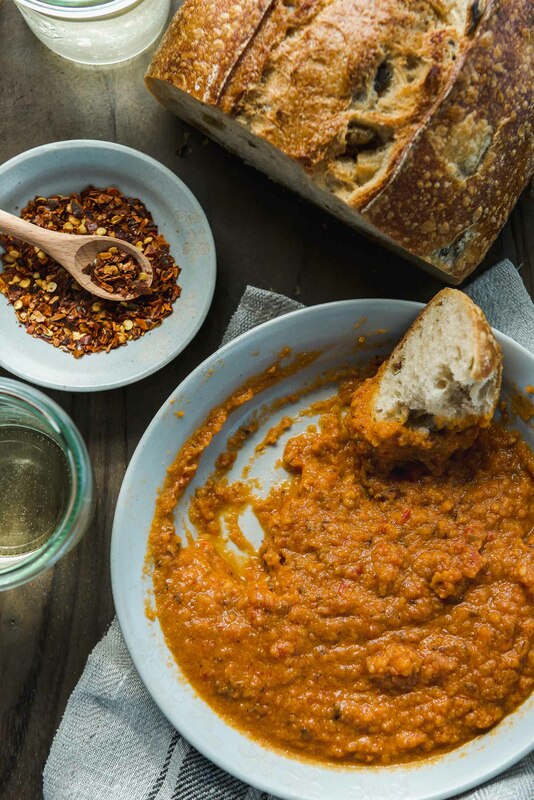 This is one of those recipes that is a classic for cocktail parties. It looks like you did a fantastic job! fab idea. 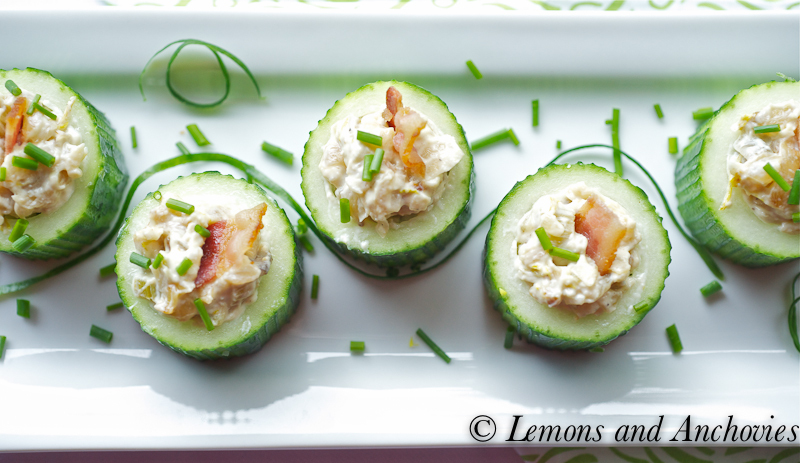 so awesome that you were able to salvage the days-old cucumber with such a fantastic appy recipe. nice work. 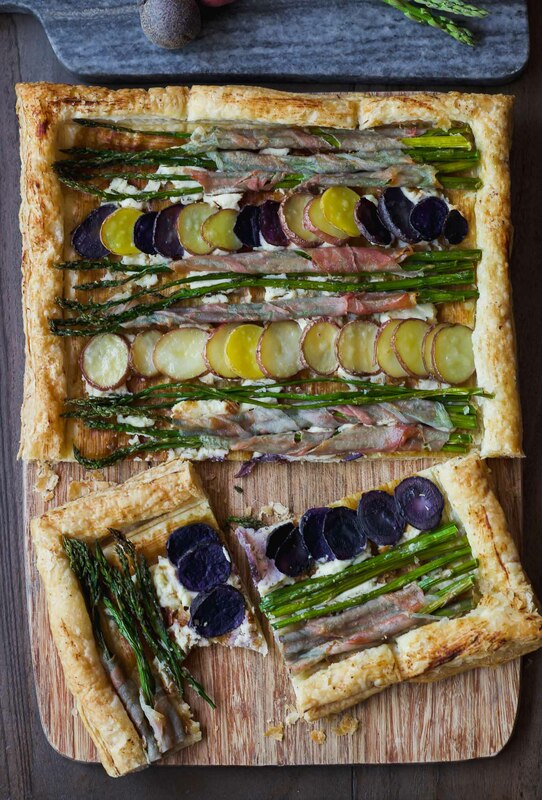 This appetizer look both refreshing and very pretty. I tink its a brilliant idea to use a cucumber this way. wow! i love how pretty these looks! thank you for sharing this with us:) wish i had one right now. What an awesome and brilliant idea! 🙂 These look very elegant and perfect for those girl-y occasions. Especially love the addition of caramelized onions and shallots. I bet it did smell amazing! Wow! These look so gorgeous! Talk about the perfect summer app! Simple but elegant is right! It’s a such a perfect summer appetizer and I love the combination of bacon and caramalized onion- nice work!! Hi Jean! This is sooooo pretty. Not only you took beautiful photos, I am sure these cucumber cups taste amazing. It’s such a nice appetizer for warm day like TODAY! Thank god sun is finally out! 🙂 I hope you are enjoying it too! These look so light and fresh. I love them as an idea for a summer app or side! How gorgeous!! I love snacks like these…they are beautiful and delicious. Your stuffing is a bit different from mine… I have never used caramelized onions… that’s about to change! So beautiful and sooo good! Love these little darlings. Great photos,too! 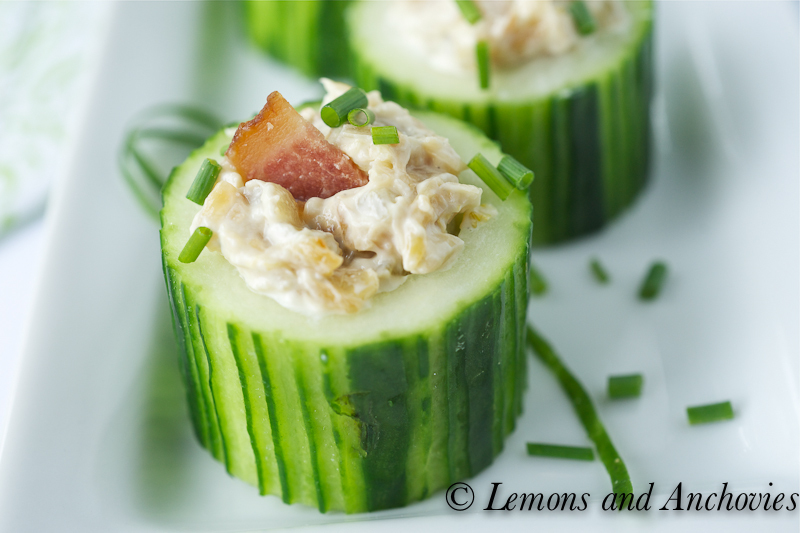 Refreshing cucumber sounds like the perfect foil for the creamy filling. What a fun appetizer! I’d love if you’d consider entering this in the online Get Grillin’ & summer barbecue event I’m hosting right now. These are so adorable… and unique. They look fabulous and so elegant. Great for a party! Beautiful presentation, Jean! After seeing your photos I am always inspired to dress my own photos a bit more but it always just ends with that though. I’m just lazy I think, and perhaps not as artistic. 🙂 I love the caramelized shallot/onion mix in the center, but the bacon looks like the best part! 🙂 I would love to taste your appetizer. Have a great weekend! I am seriously in love with this idea. What a great use of old fridge items! What a great idea. I love cucumbers and caramelized onions so I will certainly try this out. 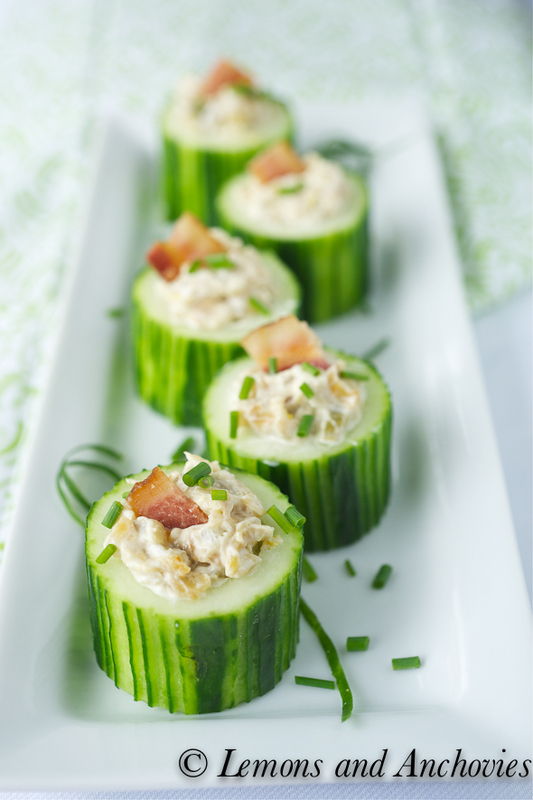 I never thought about using cucumber cups – genius idea, Jean. Hope all is well. Happy Summer! Love this idea, Jean! We’re always having dinner parties and cocktail get together and it would be perfect for passing around. Looks amazing! Such an elegant and beautiful appetizer! I love that the cucumbers serve as a crisp vessel to hold all that sour cream & onion goodness! Wow, a forgotten cucumber. You really turned these cucumbers into a treasure find – – beautiful! Nice site you have. Thanks for sharing! What a great idea! These are so cute and great for a party! So simple but fancy! I love cucumbers! Very cute, very fancy and a bite of deliciousness to inhale! Great inspiration. Gosh, those look delicious. And such a clever idea! Oooh, these are so pretty. And they’re making me hungry. That’s really saying something, too. Usually only pictures of cupcakes that make me hungry. Very good idea! I made them and it is wat you say……..you can make them easily and they look very nice. Also light if you make it as a entree. Great recipe! I just made these for Memorial Day Annual cookout and they were a huge success. These are incredibly, and surprisingly, filling. The carmelized onions and shallots add a fresh kick to the sour cream. I used low-sodium bacon so I garnished each with a little salt to give the flavors a pop. Could the filling be made a day ahead? Having a cocktail party in two weeks and wanted to use this recipe as it looks perfect for this occasion. Cucumber Cups … brilliant idea, so colorful. I might use some tuna for the filling. Great snack, or as appetizer, or party treat!